CC got a major treat on Saturday, when she and I went to Disneyland with our friend Alex, who's visiting from Germany. It's been fun showing Alex around the city—this blog has definitely come in handy—and the ultimate outing happened to be the Happiest Place on Earth. And, I have to say, it was pretty amazing. 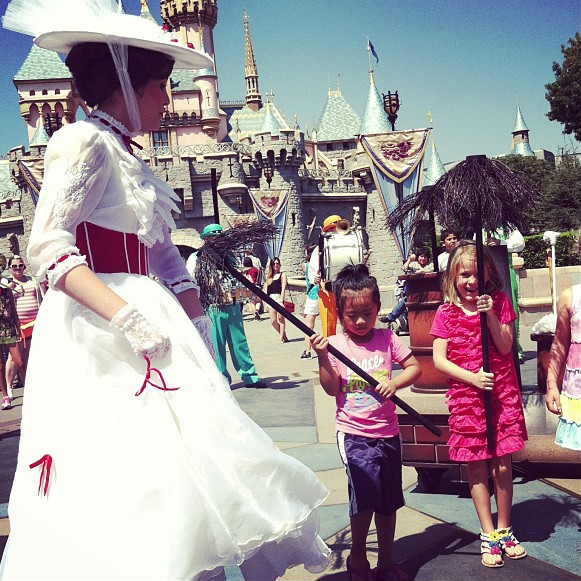 We packed so much in—the carousel, the Small World ride, the Alice in Wonderland ride, Finding Nemo and more. Not only that, but CC got to learn how to be a Jedi. Awesome. 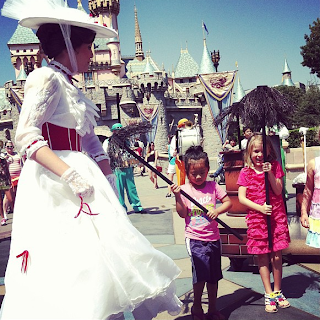 I loved watching her get excited about the rides, dancing with Mary Poppins and finally, as we were about to leave, meet Disneyland's biggest character, Mickey Mouse! Happy First Day of 1st Grade! 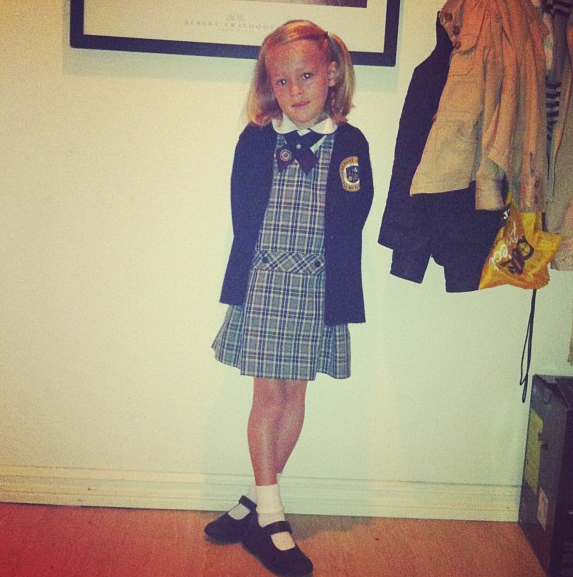 I remember writing a similar post last year, when CC started kindergarten, and being barely able to get through it. Yes, I was one of those blubbering parents, who waved goodbye on the first day of school through a curtain of bittersweet tears. But, actually, what I really think is that it got easier. Yes, it's hard to watch your child go off into the great unknown, but this year it was much less "unknown" than last year. She's at the same school, she has her friends, and she basically knows what to expect. And she's going to do an amazing job. As usual, I'm so proud of her! 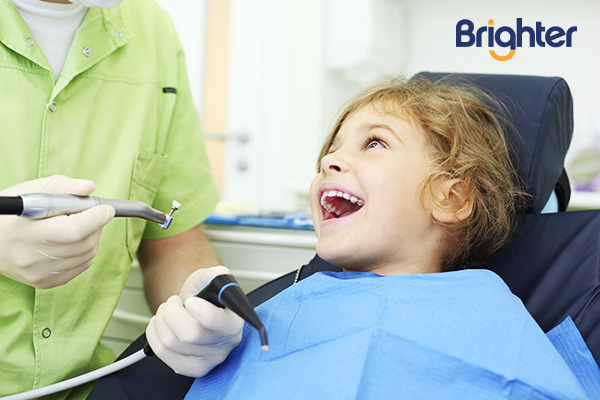 As parents, we know how important it is to make sure our kids' teeth are clean and healthy. After all, we want the tooth fairy to come only for special occasions. We also want our kids to perform well in school, but poor dental health can affect kids' school performance, according to studies and data from the American Dental Association and the University of Southern California Ostrow School of Dentistry. In fact, children miss an average of 2 days of school due to dental problems. That said, a surprising number of Los Angeles residents are opting out of dental plans altogether—a whopping 47%. The top two reasons for that are cost and fear of cost, according to Empirica Research and Brighter.com, a free (yes, free!) alternative to dental insurance. Brighter.com has partnered with more than 500 dentists in L.A. County and pre-negotiated the prices of more than 400 procedures. That means that when residents book their dental services through the website, they can save an average of 50% on any procedure—and up to 70% on cleanings. The company also covers procedures such as braces and whitening, which aren't always included on dental insurance plans. 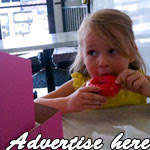 Simply sign up for free on Brighter.com and gain access to a directory of dentists all over the county. Members can search by Zip code and check out price comparisons, as well as the dentists' Yelp reviews and credentials. You can even browse photos and videos. An especially convenient part? You can schedule your appointment right on the site. That's a big plus for busy parents who don't want to stay on hold for a long time or juggle the phone and a calendar. And because the dentists in Brighter.com's network pay a fee for handling their scheduling and member communications, L.A. County residents who sign up don't have to pay a fee themselves. So parents, don't be afraid of costs any longer. Your children—and their beautiful teeth—need you! Being a princess is about more than fancy dresses and bejeweled crowns, according to Sofia the First, Disney's newest little royal. 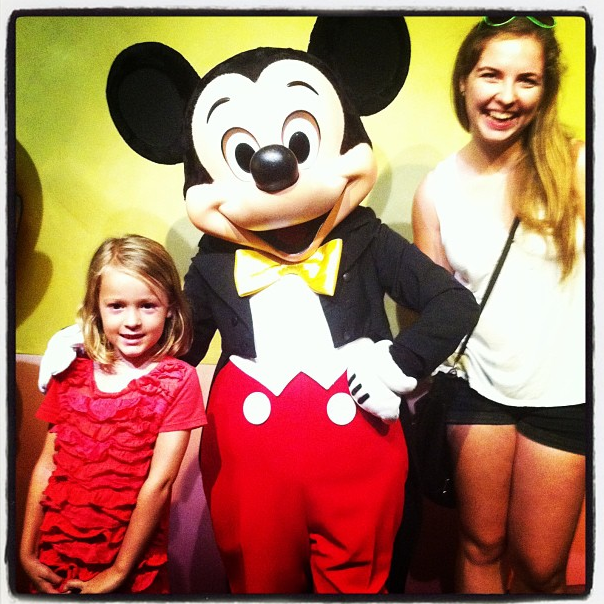 And that's the message I love for my own little princess—that it's about heart, kindness, generosity and loyalty. CC is a big fan of the animated show Sofia the First (Fridays at 9:30 a.m. on Disney Junior), and we were just watching an episode in which Sofia learns the importance of friendship—and how easy it can be to hurt a friend's feelings. She and Clover the Rabbit enter a contest, but when she finds another bunny that can perform better than Clover, she ditches him so she can have a better chance of winning. Fortunately, she learns that that's not the way we treat people (or our animal friends). 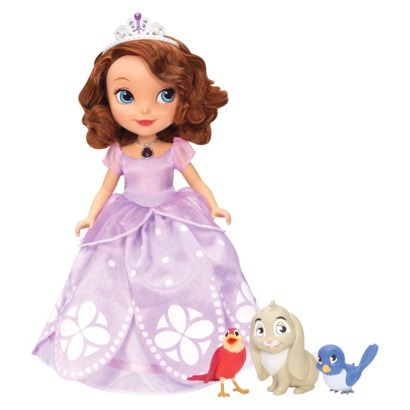 Speaking of friendship, Mattel's new Disney Sofia the First "Talking Sofia and Animal Friends" set (SRP: $39.99) focuses on just that. Through Mattel's Disney Insider Playtime program, CC and I got a chance to check out this cool toy, which has some really fun features. Not only is this 10.5-inch Sofia the First doll a great size for playtime—very sturdy for little hands—she also has a pretty purple amulet that glows when you push it, which also gets Sofia talking. What's especially cool is that when you hold one of her animal friends close to her—Clover the Rabbit, Robin the Robin or Mia the Bluebird, all of which are included—she and each little friend has their own conversation. This basically blew CC's mind. 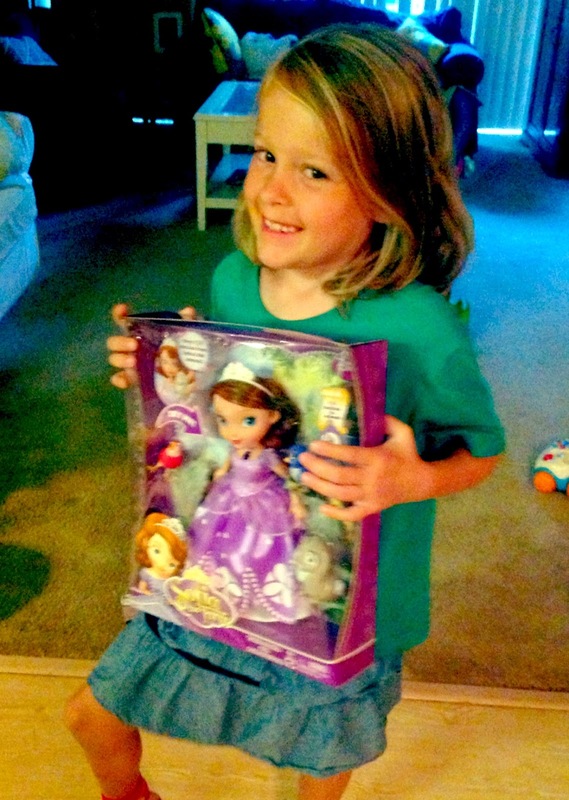 Playing with Sofia the First is, of course, fun for kids. It's also great to have a discussion about what kind of princess Sofia is and what it means to be kind and generous, among other nice traits. "Sharing my favorite toy," she said. Yes! Very kind and generous. More later on our progress with that. Fingers crossed! 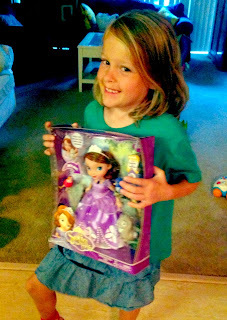 I'm giving away 1 Mattel Disney Sofia the First "Talking Sofia and Animal Friends" set, courtesy of Mattel. To enter, leave a comment below, telling me what kindness, generosity and/or honesty mean to your little princess. Good luck, and I will announce the winner on Friday, Aug. 30! Teaching your kids about money can be tricky. Of course you want them to save, but how can you make it appealing for, say, a kindergartner or even an elementary schooler, who wants something new seemingly every five minutes? 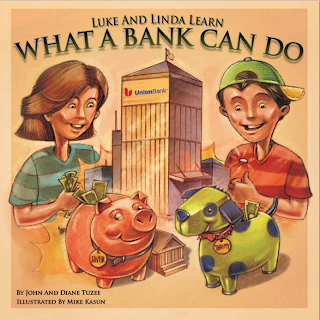 What a Bank Can Do, by children's book authors John and Diane Tuzee, shows kids the benefits of saving and how easy it can be. Through our pint-sized savers Luke and Linda, kids can read about what actually happens to their money once they put it in the bank. Besides showing that the money is then lent out to other people, What a Bank Can Do illustrates just how banking can help the community—by helping people buy homes, cars and start new businesses. It's amazing to be able to show CC how it's all connected. Yamashiro Farmers Market will be hosting a benefit tomorrow, Aug. 15, to benefit longtime performer Ellen "Twinkles" Meyers. The entertainer, known for her funny costumes, face painting and silly balloons, suffered a stroke last year that has prevented her from performing. She had been with the farmers market since it started four years ago. Ian, CC and I visited the farmers market three years ago (can't believe it's been that long! ), and CC loved watching Twinkles turn ordinary balloons into colorful creatures. The special night will include live music performances from actress Minnie Driver, band the Furious Seasons and Twinkles' entertainer friend Zan. In addition to the yummy food and drink booths, there will be arts and crafts for kids from Art Rebel and a raffle that will include a prize from Luce Spa. For more info, visit LACityFarm.com. 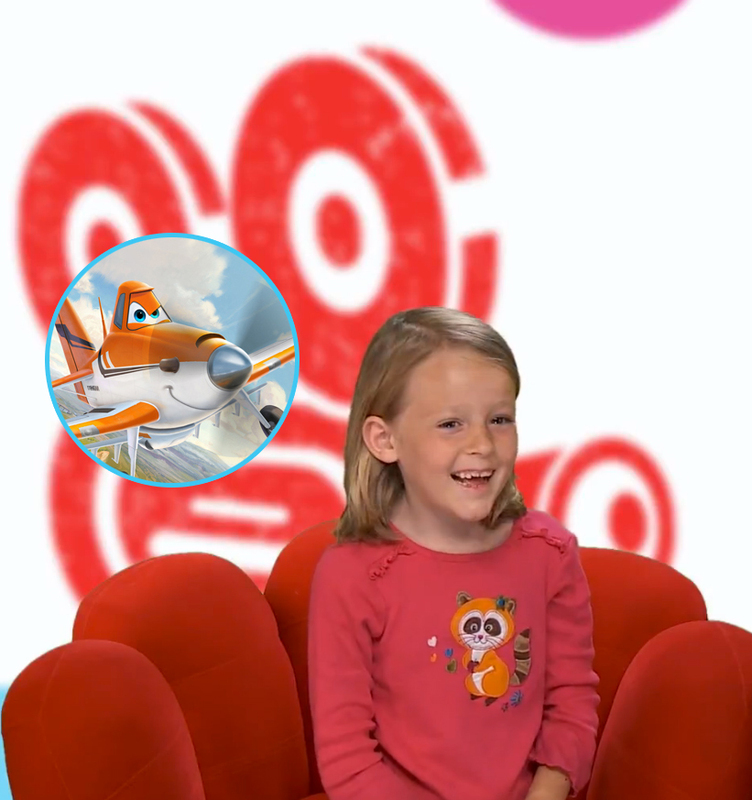 If you haven't yet had a chance to check out Disney's new animated film Planes, you might want to head over to mom.me to check out CC's and my review of the movie. While I thought it was cute but felt a little familiar, CC thought it was amazing. And what I loved about her review was her total enthusiasm -- and that unexpected reference to Justin Bieber. That made my day. And speaking of movies, I caught a sneak peek of mom Keri Russell's newest movie, Austenland, from Stephenie Meyer's (Twilight) production company. The Sony Pictures Classics pic stars Russell as a 30-something woman who uses her life savings to visit a Jane Austen-themed resort in England. Let's just say she's obsessed with Mr. Darcy. It's a fun romantic comedy for the Pride & Prejudice set. I was able to chat with Stephenie Meyer and Keri Russell at a press conference last week. 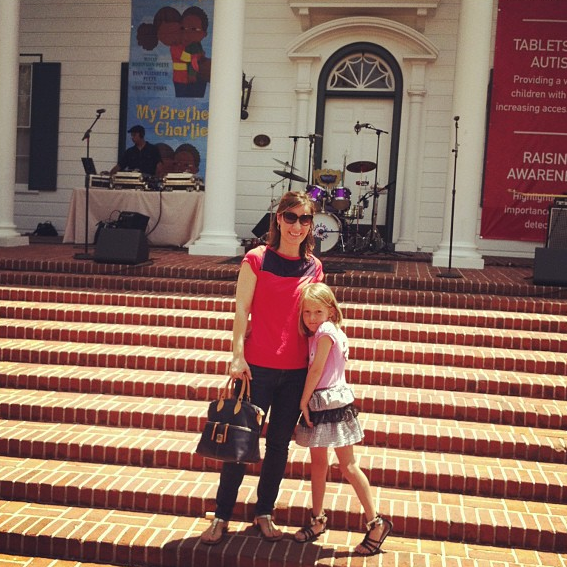 Head over to mom.me to read 5 reasons why Russell is the cool mom. It's amazing what a drive downtown can do. 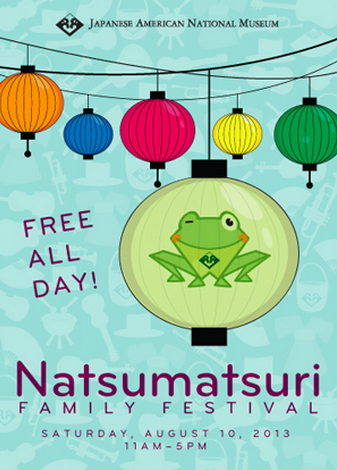 On Saturday, the Japanese American National Museum hosted a free Natsumatsuri family festival to celebrate summer, and CC and I were there. We've visited the museum several times, and it's always amazing to watch my daughter to explore another culture—albeit one that's very recognizable to her. At the festival, there were fan-making stations, origami stations, Japanese mariachi (we missed that, unfortunately! ), among other cool crafts. We even ran into L.A. Story reader Crystal and her daughter Maisie! CC enjoyed making an origami frog and decorating her own Japanese fan, but what I loved was immersing ourselves in such a different part of town. Of course that's what this blog is all about, and it was such a great reminder of why I started it—because L.A. is an amazing place for families. There's so much to see and do, and one activity on one weekend can be completely different from one on the next weekend. After we hung out at the museum for awhile, we headed over to the Japanese Village Plaza across the street for mochi. If you've ever grabbed the box of Mikawaya's frozen mochi at Trader Joe's, you have to head down to the company's storefront in Little Tokyo. 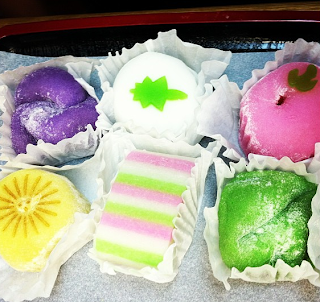 There's ice cream mochi for $1 in so many different flavors and mochilato (gelato in mochi form) for $1.25 each. I indulged in Kona coffee mochi, while CC opted for the mint chocolate and chocolate hazelnut varieties. We were having dinner with friends that night, so I picked up some colorful (room-temperature) mochi. While CC preferred the frozen variety, I loved having a Japanese treat to take back home. 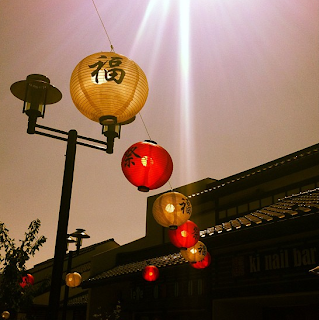 And it only took a drive downtown to feel as if we were miles—and an entire culture—away. 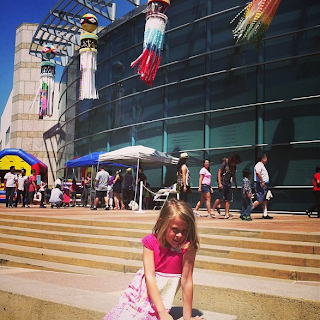 CC and I love the Japanese American National Museum downtown in Little Tokyo. Remember this time and this time? 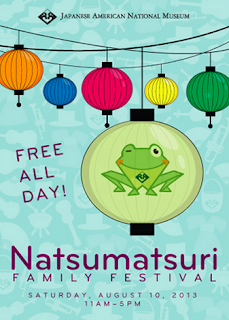 So I was excited to hear that the museum will be hosting its free Natsumatsuri Family Festival on Saturday, Aug. 10, from 11 a.m.-5 p.m. "Natsumatsuri" means "summer festival" in Japanese, and the museum has a lot planned for the kiddos. If your kids love drums (CC does! ), they'll love the Taiko demonstrations and performances. There will also be origami lessons, a bounce house, a toddler room and crafts, including fan-making. Sounds like fun! Hope to see you there! CC and I at The HollyRod Foundation's "My Brother Charlie" Carnival. 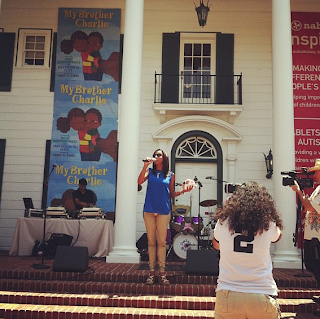 I have seen several moms tear up when they talk about their child who has autism—and one of those moms was actress Holly Robinson Peete, whose teenage son is on the spectrum. The 21 Jump Street actress and former co-host of The Talk was both down-to-earth and feisty when she hosted a small reception in Beverly Hills in May to raise awareness about autism and The HollyRod Foundation, an organization she and husband Rodney Peete launched to benefit autism and Parkinson's Disease. She wanted to get the word out about the disorder and she wanted to help—not just her son, but all families who have sons or daughters with autism. Because, as she said, even getting a simple haircut for a child on the spectrum can be an agonizing experience. 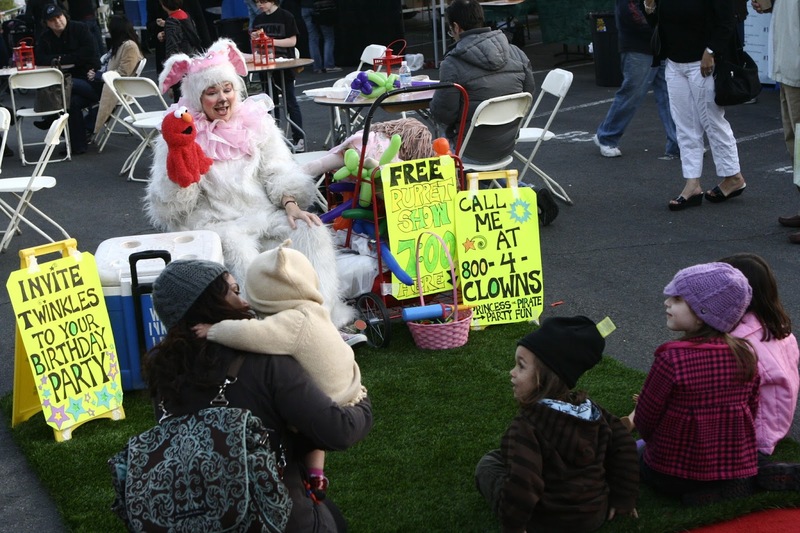 That's why Holly and Rodney created the "My Brother Charlie" Carnival, which just celebrated its fourth year, at Culver Studios in Culver City this weekend. CC and I were invited to attend, and it was an amazingly welcoming event for all families, but especially those who live with autism. There were bouncy obstacle courses, a petting zoo, a dunk tank, a mobile aquarium from Aquarium of the Pacific, face painting, live music and more. There were also buffet lines, where families could grab a bite to eat—everything being inclusive in the ticket price. It was a gorgeous day and so family-friendly and relaxing. Holly Robinson Peete welcomes everyone to the carnival. Also on hand was presenting sponsor Fuhu, Inc., which makes the child-friendly nabi tablet—and offers the device at half-price to kids who have autism. The "My Brother Charlie" Carnival is named after the book of the same name that Holly wrote with her daughter, Ryan. It was inspired by Peete's son, R.J., and explains that Charlie's brain works in a different way, which makes it harder for him to make friends. But while he might not be great at certain things, he's amazing at others. I had a chance to sit down with Holly in May to talk about autism, misconceptions about the disorder and what it was like to write a book with her daughter. L.A. Story: What's the biggest misconception about autism? Holly Robinson Peete: There are so many, but probably the biggest is the concept of the spectrum. What is the autism spectrum? It starts down here with children who are nonverbal, sometimes almost like a deaf child where they have no response no interaction but they do hear you and they have a lot to say. And that's why you have tablets like the nabi—these are ways for them to express themselves. And then you have the other end of the spectrum, where you have children who are highly verbal, brilliant, closer to Asperger's and just can't look you in the eye and make a friend. 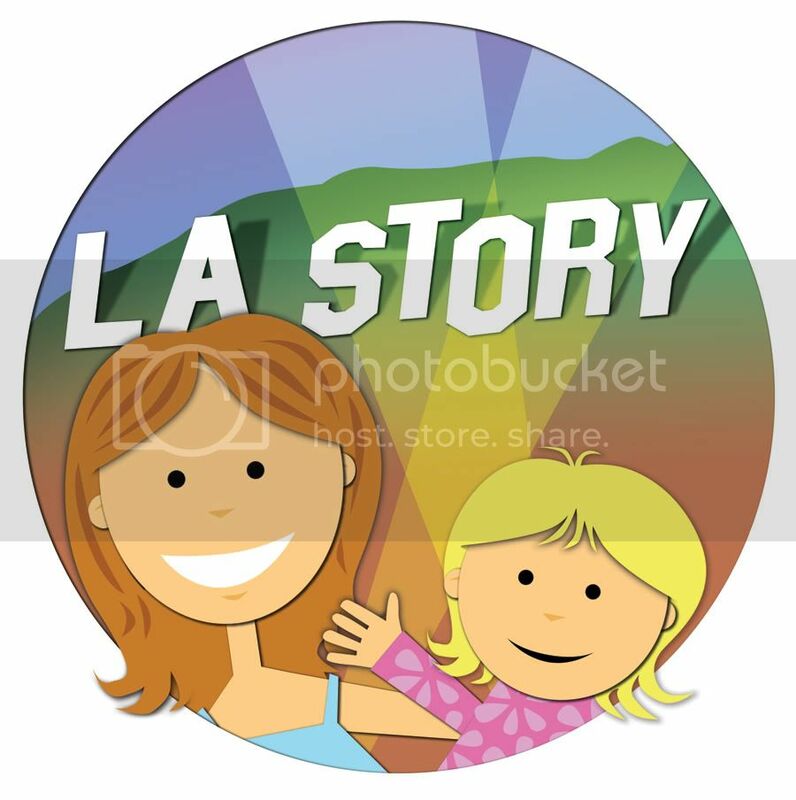 L.A. Story: What was it like writing a book with your daughter? Holly Robinson Peete: My daughter was 12 when we wrote the book together. It was very cathartic because she had so many emotions that she needed to express that I wasn't really aware of. Just feeling so connected to this boy and taking on a lot of his issues, however also feeling very neglected herself. That was really difficult for me to hear. She said, 'Sometimes, Mom, I wish I had autism so that you would pay more attention to me.' But yet she takes on all of his issues and his problems. So I learned a lot about her feelings about being a sibling. L.A. Story: Do you think she realized it before you and your husband? Holly Robinson Peete: No, she just accepted him for who he was. We were all rookies at that point. L.A. Story: You mentioned that if you asked your son if he has autism, he would say no. What does that mean? 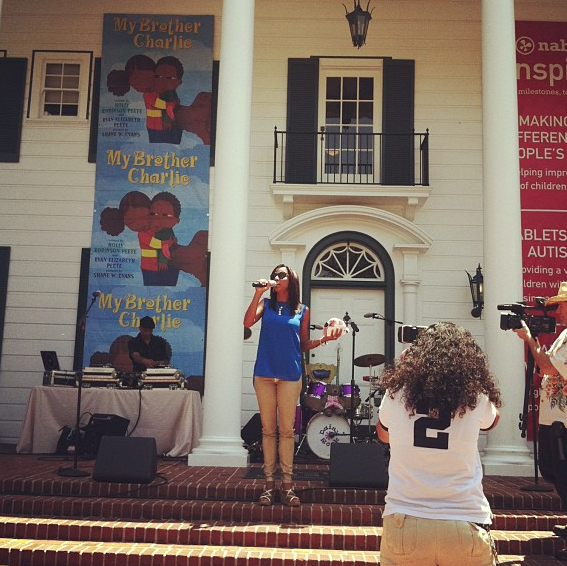 Holly Robinson Peete: He at 15 does not want to be labeled. He's struggling to fit in and doesn't want to be different. And that's very typical for any kid, even if they have ADHD, or Asperger's, or dyslexia. Whatever it is, it's very hard for them to navigate the teenage boy waters—how do they run with the pack? L.A. Story: I saw a video of you and your daughter talking about the book and explaining to kids about autism and that your son had memorized all the presidents. Holly Robinson Peete: You talk about the deficits and strengths, and that really brought forward a lot of good information. It made (the kids) go, 'Oh yeah, I have my issues, too.' And that really leveled the playing field. 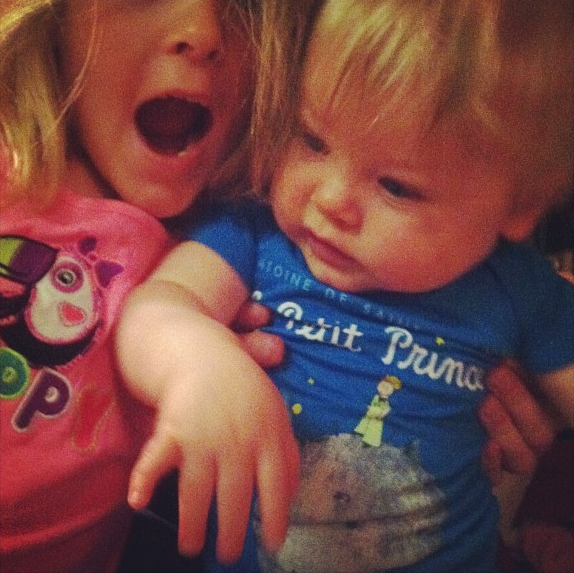 Baby Will rocks a "Le Petit Prince" onesie from Out of Print. How cute are these onesies?! If you are the literary type -- and, let's face it, who doesn't love a classic children's book -- these 100% cotton baby bodysuits from Out of Print are perfect for your little hungry caterpillar or petit prince. Baby Will is sporting a Le Petit Prince onesie in the above pic that was sent to my office. 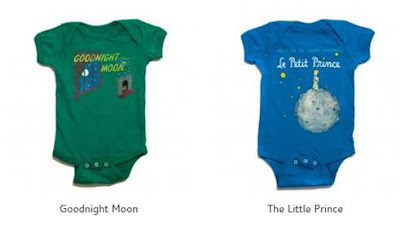 I love the classic cover images (they also have The Very Hungry Caterpillar, Goodnight Moon, Don't Let the Pigeon Drive the Bus and The Day the Cow Sneezed) and how the purchase of each $22 onesie sends a book to a community in need.